Enjoy the magic of snow where sunshine & brightness warm you right up. 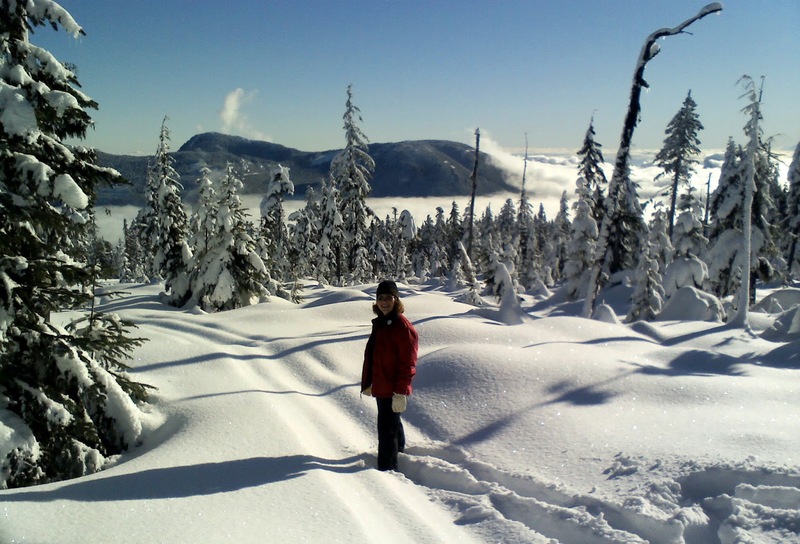 Leave all the details to us while you play in the snow of Dakota Ridge high above the Sunshine Coast. In order to recognize the value of our guides, cancellations within 1 week will be charged a $100 cancellation fee. Cancellations within 24 hours will be charged the full package price. What a day! This is the last official weekend of the season at Dakota Ridge, so I made the most of it. Peace and quiet…no phones, no email, no human contact for a couple of hours. Conditions were fabulous when we arrived: 45cm (1.5ft) new snow in the last 2 days and the sun was trying to peak through the clouds. I took off for the Eastern Trail where views of the North Shore Mountains can be seen. Unfortunately it was too cloudy. I could see the ocean, but no views of the neighboring mountains. In previous trips, I had always been with small groups. I usually just followed the group without thinking about where we were going. Today I was on my own. It is incredible how quiet a snow covered forest is. But when you stop and really listen, there are birds and the sound of fresh snow falling from the trees. 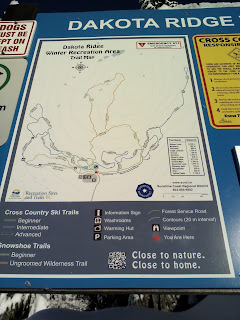 I was very happy with how well the trails are marked. Just as I passed a marker, I could always see the next trail marker in the distance. 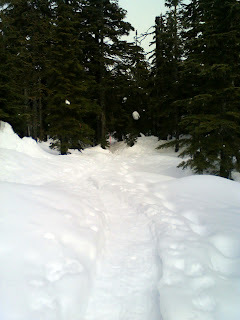 Even though I was walking in fresh powder and “breaking trail” through much of the hike, I never felt at risk of being lost. 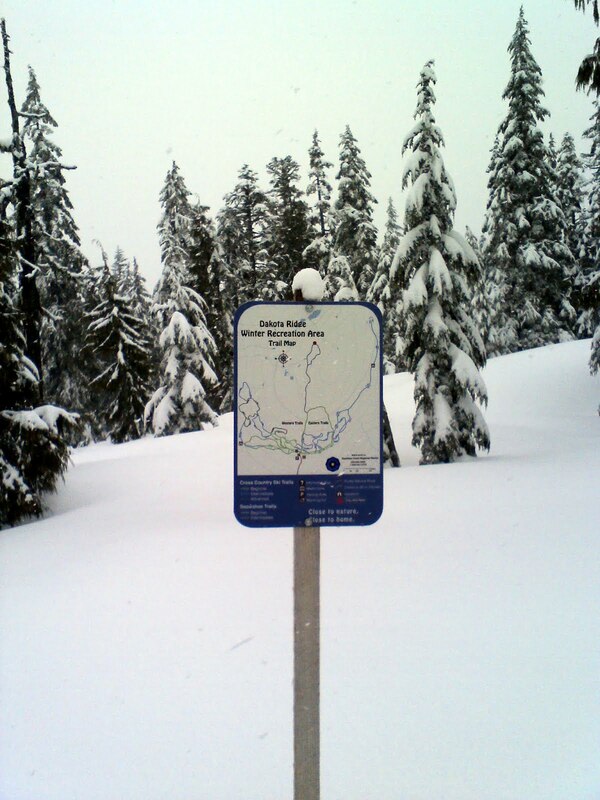 Dakota Ridge has 8km of marked snowshoe trails. I hiked the Eastern Loop and then the far Northern Loop. 2 full hours of pure peacefulness. About halfway in, it started to snow. Very light flurries that seemed perfectly appropriate given all the fresh powder. Then it really started snowing. Anyone heading out tomorrow will have an excellent fresh snow experience. At sea level, it was another of those grey days with long periods of drizzle. 1,200 meters up the mountain, it was a winter wonderland. Even though there were a number of people skiing, snowshoeing & tobogganing, I saw only 2 people on my entire 2 hour hike. 1 at the very beginning and 1 at the very end. The rest of the time I had the place to myself…alone with my thoughts and with nature. Back at the warming hut I caught up with friends who had been skiing, and we shared stories of the day. So sad to have another winter season end, but I will sleep well tonight and enjoy the memories until next season. 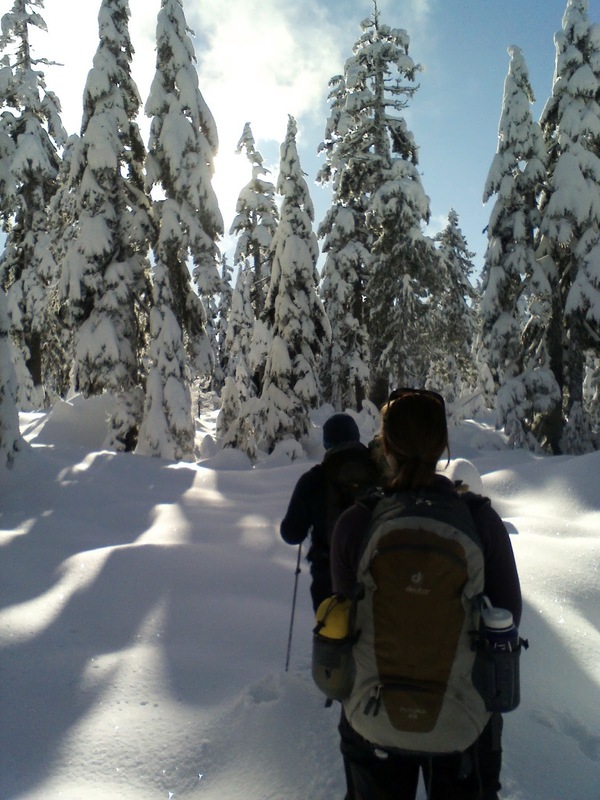 Alpha Adventures will continue guided treks as long as the snow lasts, but officially the season ends tomorrow. Get up there if you have the chance! Today was “fun in the snow” day … Winterfest 2012 on Dakota Ridge. Look at all the snow! The ridge is up to a 2 meter base with 15cm just last night. It snowed off and on throughout the day and you can bet there is more falling tonight. It still seems a little strange to live in Canada and yet hardly ever see snow. We’ve only had 1 little snow all winter this year and that was only a dusting that didn’t last more than few hours. I swept the sidewalk…no shovels necessary. So when I get the chance, I make the short 1 hour trip from Arcturus Retreat up to Dakota Ridge. Today there were plenty of extra events…equipment demos, training clinics, and races all in support of our local Jackrabbits program (cross country ski instruction for kids). These are the brave souls awaiting the starting gun for the 5km snowshoe race. Meanwhile, I was trying skate skiing for the first time. 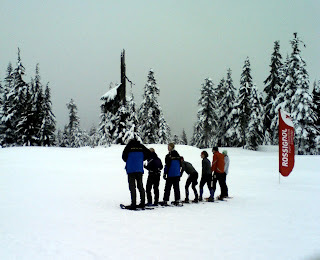 Our group had a very good instructor, Tyrone, who made everything look effortless. I didn’t go very far, but every once in a while I felt I was actually doing it correctly. It takes a lot of concentration to break yourself of downhill ski habits. Skate skis are only 2″ wide and only as tall as I am. Much lighter and more mobile, but good balance is very important. Your whole body is moving, whereas with downhill it is more about shifting your weight and keeping center of gravity. My real joy is found on snowshoes. Hiking, but with really big shoes. Posing among the trees is my awesome guide, Annie. 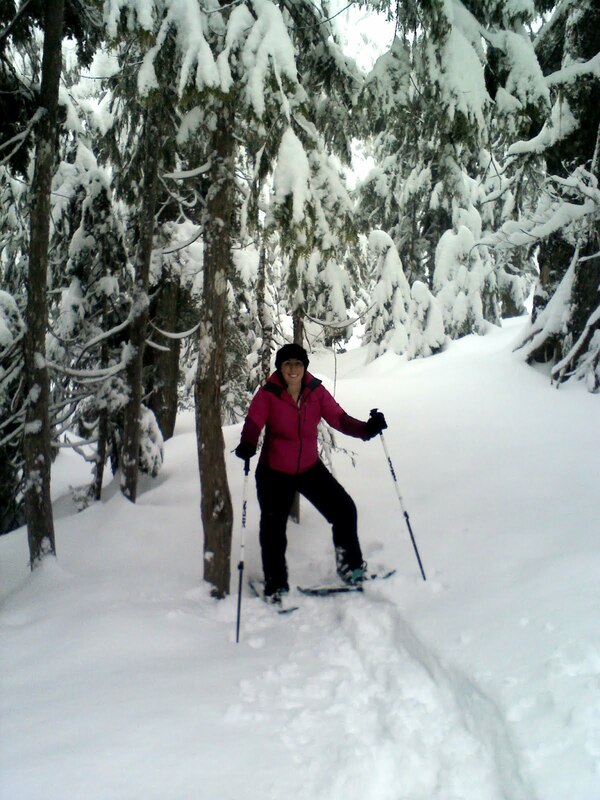 Dakota Ridge has 8km of marked snowshoe trails, but the real fun comes in breaking fresh powder. Note in the picture, there is no trail out front…just the path that we’ve created. 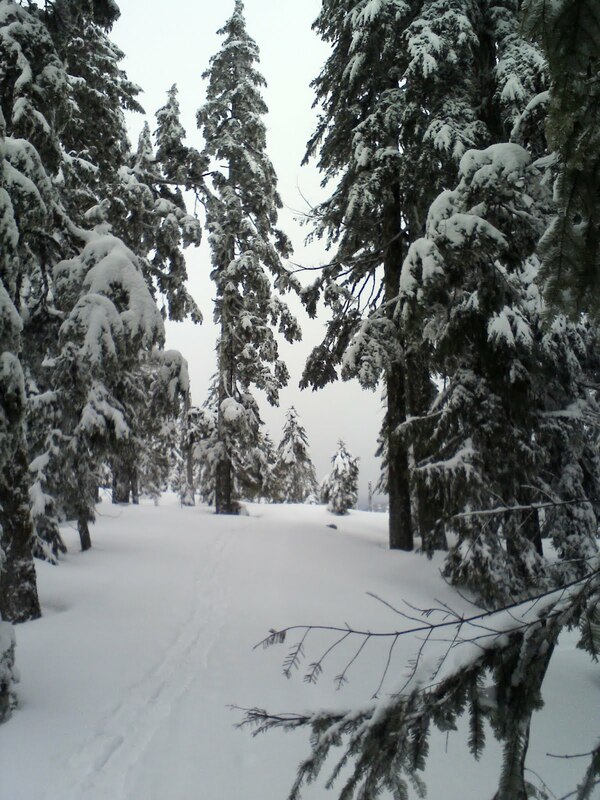 There is something special about being the first person to walk across completely perfect, untouched snow. It is like no one has ever been in that spot because each snowfall wipes the slate clean. If you don’t have a lot of experience, it is best to have a guide like Annie who knows the terrain and watches out for tree wells, creek crossings & other danger spots. Besides, you can just stare at the gorgeous scenery instead of worrying about getting lost in the forest. Thanks for a great day to my friends at Alpha Adventures who organized the event. Can’t wait for more fun in the snow. Just 3 more weeks to enjoy for this season! 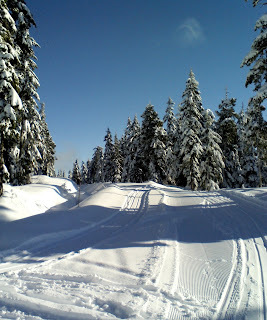 I had the most incredible day…a perfect day of sunshine up on Dakota Ridge. Warm temperatures, clear skies, and views that you just can’t beat. Oh, and did I mention 285cm of snow? That’s almost 10 feet! I know I’ve posted about Dakota before, but this was what it is all about. Clear skies, sunny and warm. 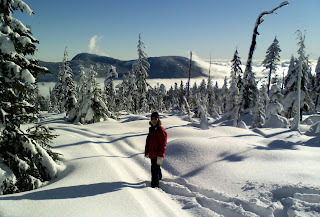 My friend Kelly and I set out on the western snowshoe trail first. The live view is better than the pics, but this is looking west across the Salish Sea to Vancouver Island and its snow covered peaks in the distance. We hiked for 2 hours and didn’t see a soul. Just incredible views and a completely peaceful forest. We headed back to the warming hut, but chose to enjoy the sun and have lunch out on the picnic table. It was a popular spot, suddenly there were people everywhere…even a bbq in the parking lot. So many families enjoying the last taste of winter during spring break. Rested and fed (with sandwiches & wraps from Strait Coffee), we headed off on the eastern trail. 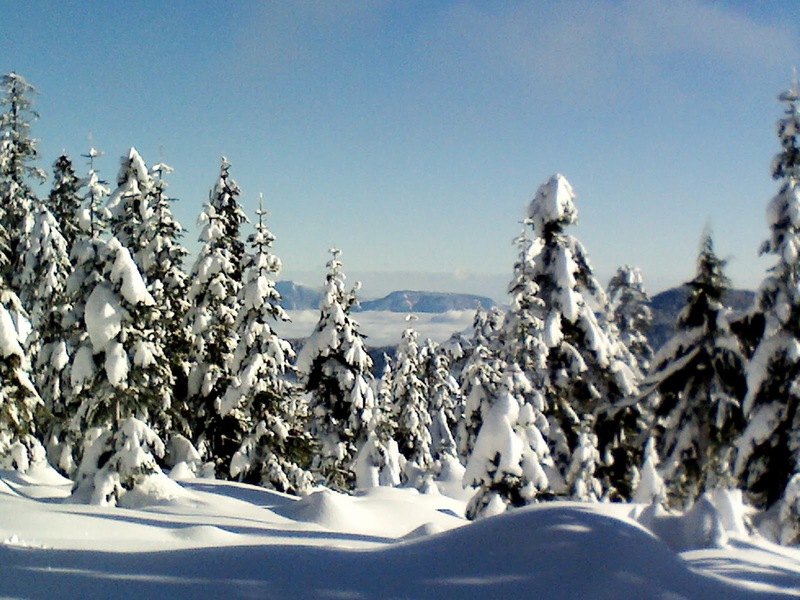 This picture is part of 13km of groomed XC ski trails with the Salish Sea in the distance. Along this trail, I soon found a familiar sight. I am lucky enough to look at the North Shore Mountains every day from my deck. Here in the distance, is the same view…just from a vantage point 1,200 meters higher. 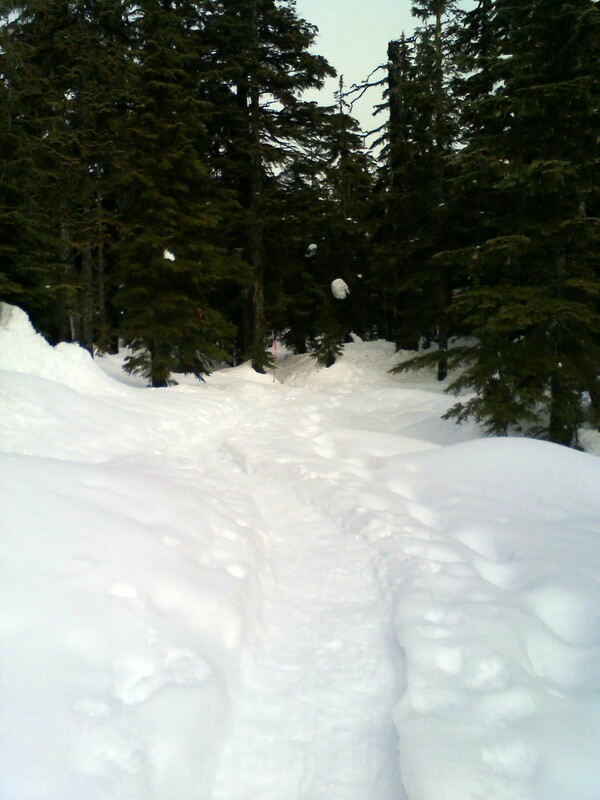 A bit further up the trail, you could see all the way to Mt Baker in Washington. No time to waste if you want to see Dakota Ridge for yourself this year. The area is set to officially close for the season on April 3. 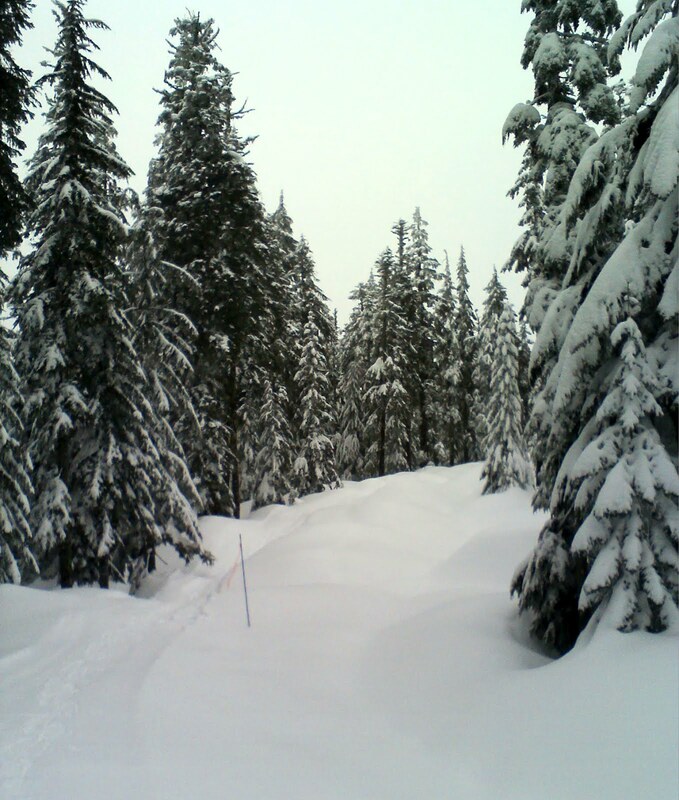 Get out there and have some winter fun! 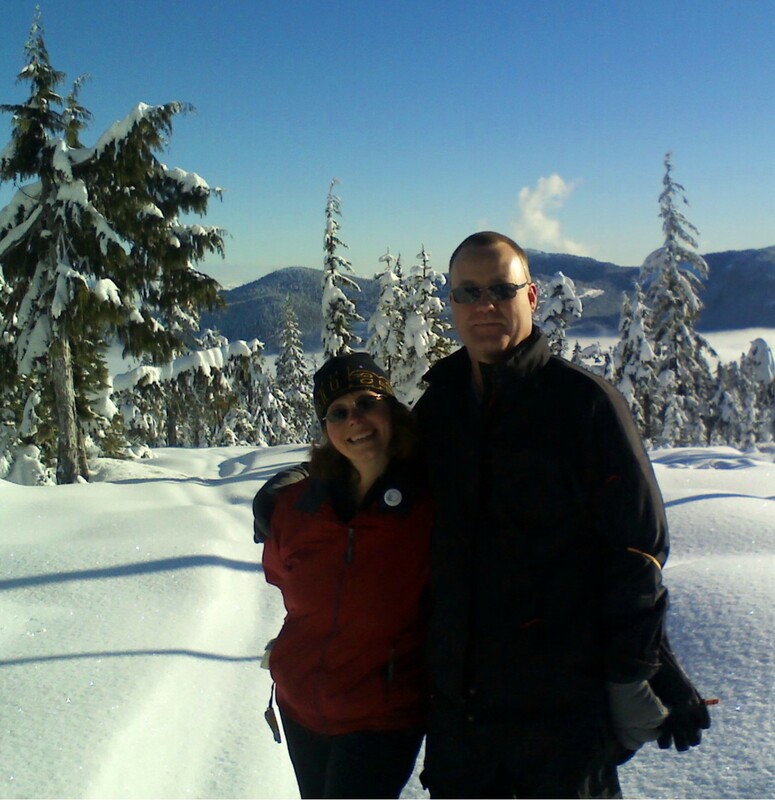 I had the most incredible day….a perfect day of sunshine up on Dakota Ridge. Warm temperatures, lear skies, and a view that you just can’t beat. 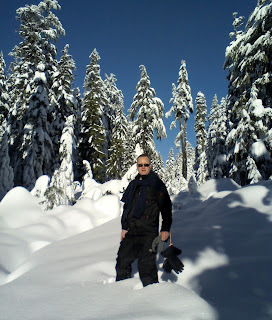 Oh, and did I mention 285cm of snow? That’s almost 10 feet! Rested and fed, we headed off on the eastern trail. This is part of the 13km of groomed XC ski trails with the Salish Sea in the distance. Along this trail, I soon found a familiar sight. I am lucky enough to look at the North Shore Mountains everyday from my Arcturus Retreat B&B deck. Here in the distance, is the same view…just from a vantage point 1,200 meters higher. Today is the 1 year anniversary of the opening ceremonies for the 2010 Winter Olympic Games in nearby Vancouver. I decided it was a day to find some snow. As you can see from my previous posts, we’ve had a very mild winter. Plenty of days to hike and enjoy the sun. I was ready for my snow and ski fix. Boy did I find snow! At sea level, it was 8C, gray and raining all day. At 1,200 meters it was just below 0 and snowing like crazy! 13cm of fresh snow by this morning and it snowed all day long with huge wet snowflakes. 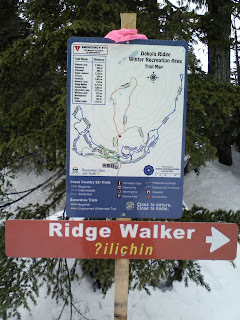 Dakota Ridge Winter Recreation Area is our easily accessible snowpark at this end of the Sunshine Coast. 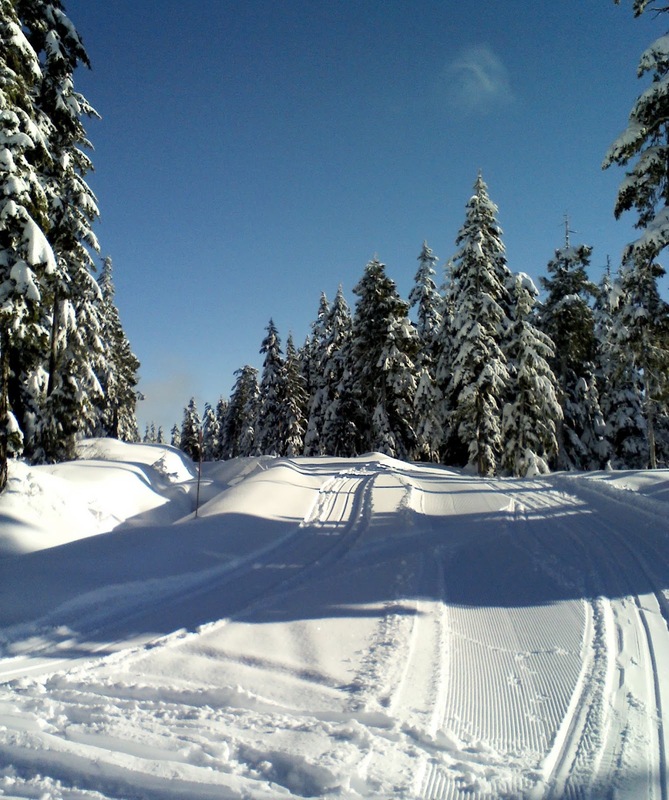 Less than an hour from the house 13km of groomed cross country trails and 8km of marked snowshoe trails await. Today my good friends at Alpha Adventures held their annual Demo Day where you can try out all the newest equipment for free. 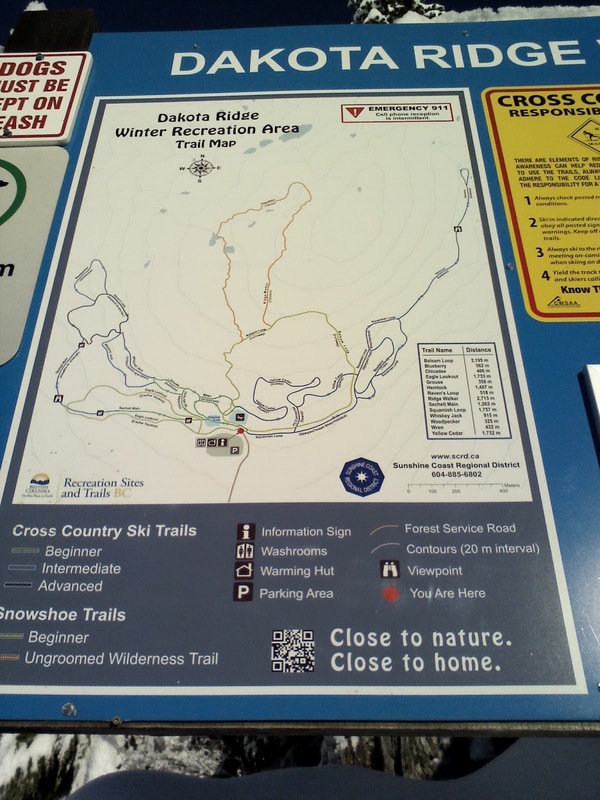 After a quick ride up to Dakota Ridge in their 4×4 van, I checked into some cross country skis and had a 30 minute introductory lesson. 30 minutes of cardio…let me tell you. It was fun…I was gliding (a little)…but its a workout. I then got to go and explore a trail for a bit to try out my new skills. Time for a little lunch and drying off in the warming hut. Picnic tables, changing rooms and a cozy wood burning stove make this a great place for hanging out and a short rest. I always meet the most interesting people. Now it was time to try out the snowshoes. I headed out into the forest with my 2 new friends, Annie & Jenny. I am so sorry not to have pictures, but it was REALLY snowing. I just didn’t want to get the camera wet. If you haven’t tried snowshoes, I highly recommend. It is just like going for a hike in the forest. 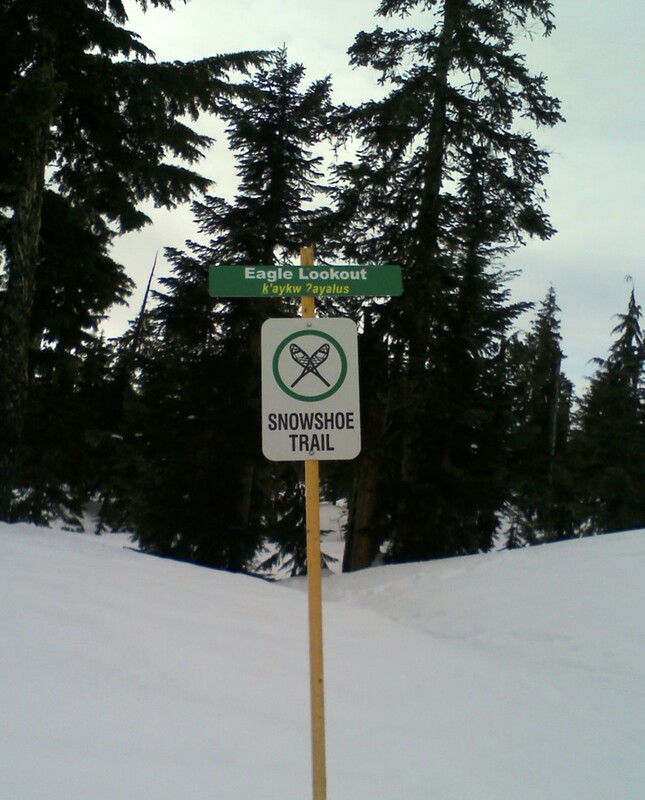 Anyone who can walk can snowshoe. It is so quiet when you get into the forest. So many stately huge trees and today they were all covered with a white blanket of snow. We were walking through areas with multiple feet of snow, but we usually only sank in about 3 inches. The trail is very well marked. 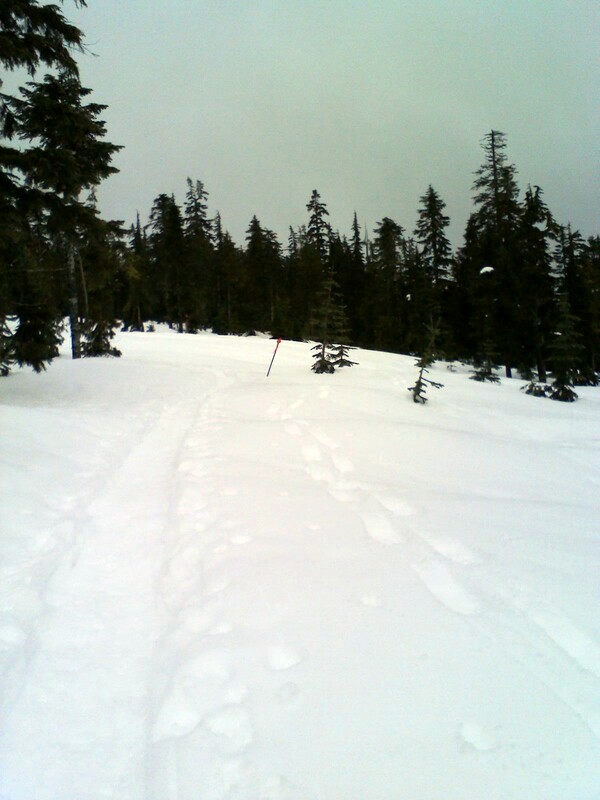 I was in the lead and had no trouble following the trail…even though the fresh snow was filling in the footsteps of whoever had been through last. You cross over a few alpine streams, and you realize just how much snow is on the mountains. Annie was telling us about her favourite viewpoints. On a clear sunny day you can see the North Shore Mountains, Mount Baker in Washington, and Vancouver Island. I’ll definitely be back this season to try it out. How to treat yourself after a great day of playing in the snow? On our return to Wilson Creek (access point to Dakota Ridge), I stopped in at Strait Coffee for a delicious cup of ginger carrot soup with homemade bread and a big cup of hot chocolate. Yum! When I got home, I jumped in the Arcturus Retreat B&B hot tub to relax those well excercised muscles.